Errol Spence Jr.’s stock is as high as ever following his commanding unanimous decision victory over Mikey Garcia last month in Arlington, Texas. 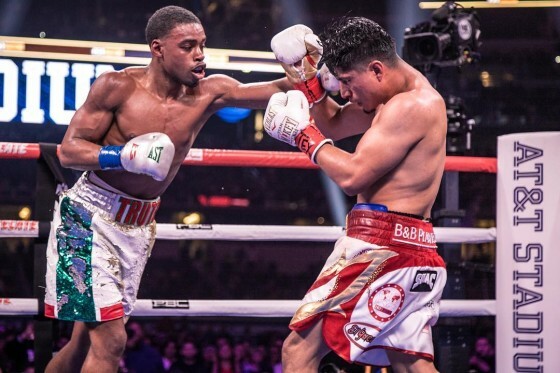 Fighting on FOX pay per view, Spence had little trouble in handling the four-division world champion from Riverside, CA in front of over 47,000 fans inside of the AT&T Stadium. After 12 rounds, scorecards reading 120-108 and 120-107 twice saw Spence raise his record to 25-0 (21 KO’s), as well as his overall standing in the sport. And another fight may be just around the corner. 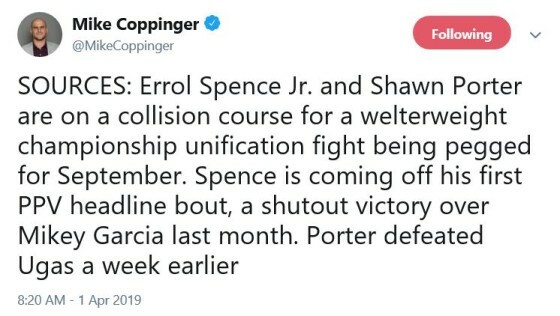 According to Mike Coppinger, Spence very well could be lined up with a September showdown with WBC welterweight champion Shawn Porter. It’s a fight that has made sense for a few years now, and the pieces finally appear to be falling into place. Spence would certainly be the favorite over Porter (30-2-1, 17 KO’s), but the Akron, OH, native would be one of his stiffest tests to date. Porter is coming off of a highly-debatable 12-round split-decision over Cuba’s Yordenis Ugas on March 9 in Carson, CA. Both men are advised by Al Haymon and fight under the Premier Boxing Champions umbrella, so this one should be relatively easy to make.